When your cat becomes sick, it can be scary and unsettling for both you and your cat. How you behave greatly influences your cat’s behavior and sense of safety. Your nursing skills also play a major role in the success of your cat’s recover from illness or injury. Take care to carefully follow the prescribed treatment from your veterinarian. Offer suggestions for treatment options specific to your cat’s personality and your nursing abilities. Show you on how to give your cat medications. They can demonstrate different techniques if needed. Communicate with you about treatment, follow-up, and signs that signal recovery. Cats that feel good tend to sleep most often in a curled position. They groom themselves, follow a normal routine, interact with their owner, and eat and eliminate regularly. 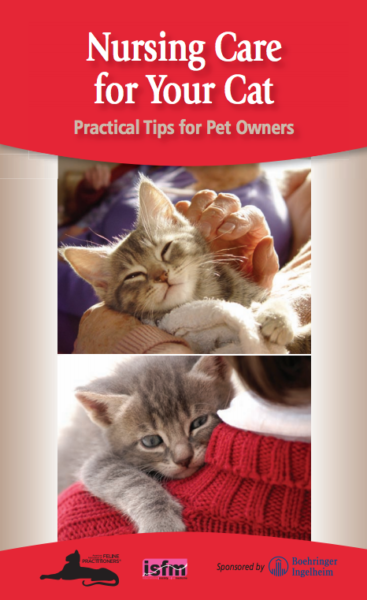 The following nursing care tips will help you take care of your cat after he comes home. Ask your veterinary practice for as much information as possible in writing. These should include references to online resources, such as videos. Do not be shy about asking the veterinary team any questions your have during or after the visit. Identify a quiet, familiar, and private space in your home, such as a small enclosure or alcove with good lighting where your cat can rest and recover. This space needs to be easily accessible for you, so you can tend to your cat’s needs. A small space allows for close monitoring of your cat and provides her with a sense of security. Give your cat positive reinforcement (e.g., treats, brushing, petting) for accepting medication. Unless your veterinarian says that medication must be administered with food, do not use food as an aid for giving medications, as it may cause aversion and reduce your cat’s food intake. Ask your veterinarian for a demonstration of how to administer the medication prescribed for your cat. Flat food dishes, such as small paper plates, and shallow water bowls may improve intake by making food and water more accessible. It can be helpful if you warm the canned food to your cat’s body temperature by gently heating in the microwave or adding warm water and stirring well. Additions of chicken broth or tuna juice may enhance taste. Food should always be fresh, provided in small portions, and replenished as needed. Attend all follow-up appointments with your veterinary practice. Alert your veterinary practice if you observe any signs of sickness or changes in your cat’s behavior, as well as any changes in food or fluid intake, or if you experience difficulty administering medications. Providing nursing care at home for your cat may seem overwhelming at first, but be patient and remember that even small improvements will contribute to your cat’s recovery. Remember that your veterinarian is there to help, so always ask any questions you have so that you can successfully provide nursing care for your cat.